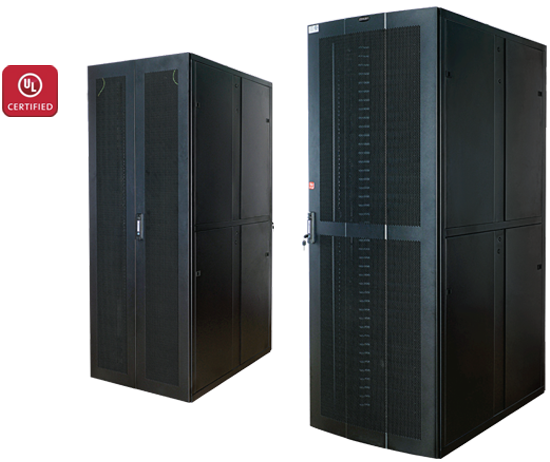 NRSe Series - Ultra rigid Enhanced Racks for high density application in data centers & server room. The Racks are manufactured out of steel sheet punched, formed, welded and powder coated with highest quality standards under stringent ISO 9001-2008 Manufacturing & Quality management system to ensure highest quality product. Standard for Racks configuration will be welded ultra rigid frame with 4 No. pillars of 14 Gauge steel sheet 6 folded profile welded to top and bottom ribbed /reinforced frame additionally supported depth wise by welding 6 No. depth rail 4 folded 75mm 16 Gauge profile. Associated with Top cover having provision for mounting Exhaust Blower and Adjustable Duct for free exhaust of Hot Air through false ceiling to PAC unit, Front Convex perforated steel door with lock & key and Back perforated /plain dual steel door with lock & key and Plain dual side panels. Free standing on plinth. Available in 42RU ~ 52RU Variants with 1000 & 1200 Depth configurations and 600 Width configurations. Top & Bottom Cover Bolted to Frame with required cut outs.